We did get tired of the heat, and occasionally we got irritated at each other. How could we not? We were in constant motion, and we sat together in inflatable bathtubs for hours on end when the air temperature was well above 100 degrees. Every day we had to hit goals, make decisions, and follow detailed rules and procedures. Of course there were glitches and disagreements. What amazes me is that there weren’t more. By the morning of Day 5, everyone knew what had to be done and we jumped on it, cooking and packing and cleaning and loading and strapping down. We were rowing by 8:30 am. The water was smooth and the winds were calm. About a mile into the day we saw a new rock layer, Bright Angel Shale, with its distinctive brown and green colors, rising out of the riverbed. We were going back in time again. These were the days when substitute boatmen like myself, Jia, Mel, and Chuck got more time on the oars. Pedro let me take the raft through Nankoweap rapids, where the waves were not quite big enough to slosh into the boat. It was great practice, because this rapid went on for hundreds of yards, through a sweeping right turn in the river and a total elevation drop of 25 feet. Rowing in rapids is challenging because when the raft and the waves go in different directions, your oars are likely to catch air instead of water. Pedro showed me that by keeping the oars low in the water and wiggling them back and forth with shorter strokes, I could do a better job of keeping the bow pointed into the waves. You don’t want to go cross-wise to the waves, if you have a choice, because it’s easier for the raft to become unstable. The game is: 1) stay in the raft, 2) don’t flip, and 3) know what to do if either of those things happen. By the time the rapids ended and I looked up, the Nankoweap Mesa was all around us. 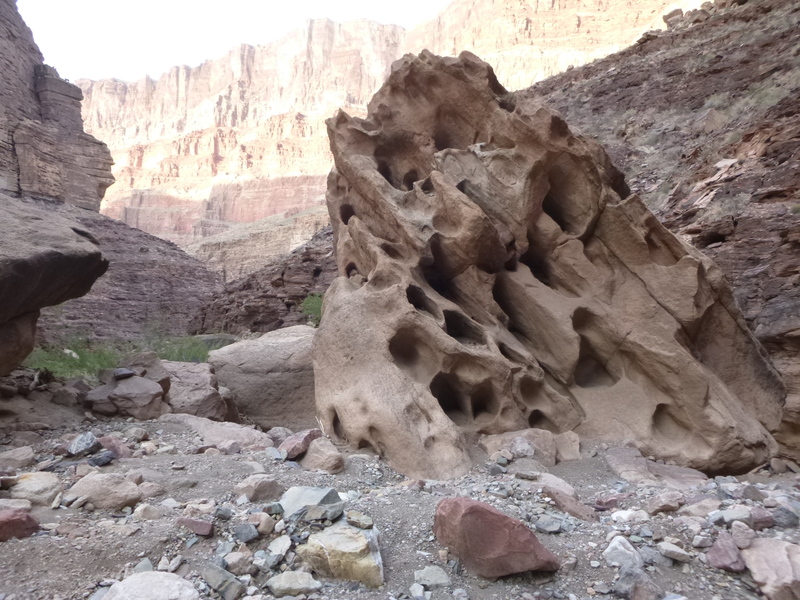 The canyon had widened, with a large, reasonably flat area on river right. It was easy to understand why this was a major archeological site. By digging a canal at the top of the rapid, Anasazi farmers could easily irrigate the flat area and grow a lot of corn, beans, and squash. We were going to hike up the cliff face on the far side of the field to see where they had stored their crops. It was a climb of perhaps 400 feet to a natural indentation in the rock. The Indians had built a stone wall with window-sized holes over the indentation, creating a granary. The sun was punishing, but it rarely reached the granary. Covering the windows would keep the contents relatively cool, dry, and safe from pilfering animals. It was also hard to get to the granary, so it might also keep the food safer from pilfering humans. 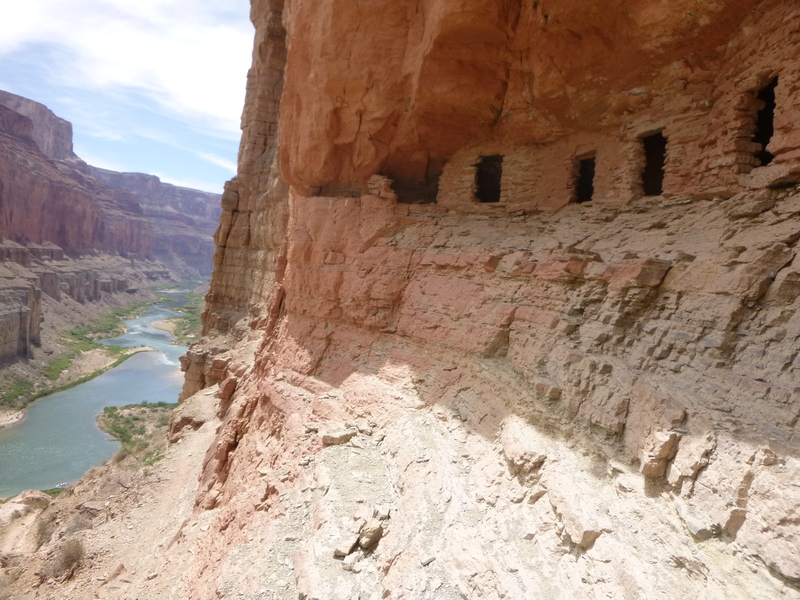 The cliff face showed evidence of several granaries, but as we climbed, the prospect of a close look at Anasazi ruins paled in comparison with the view. 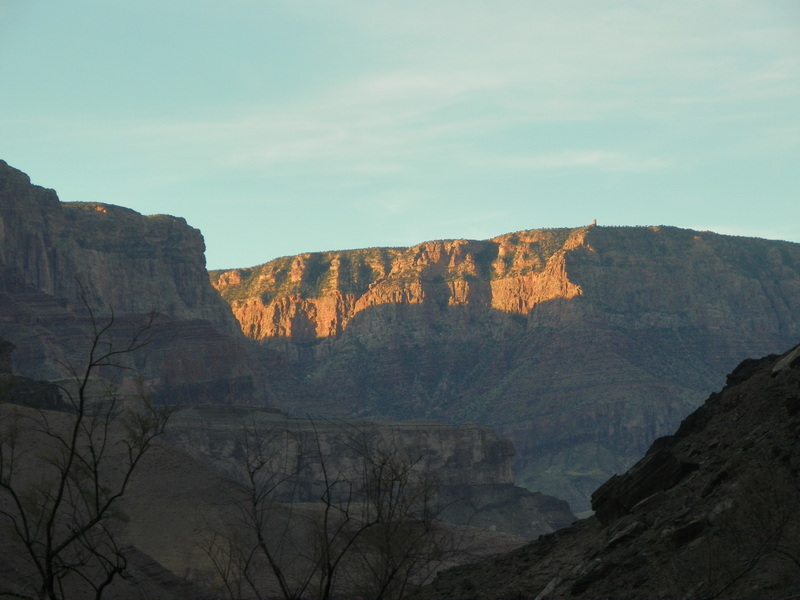 This trail is one of the most-photographed spots in the Canyon because it gives you a 180-degree view of the river and the South Rim (see top photo). Christy had brought a copy of Ice Cream Social, the book about Ben & Jerry’s I published recently. 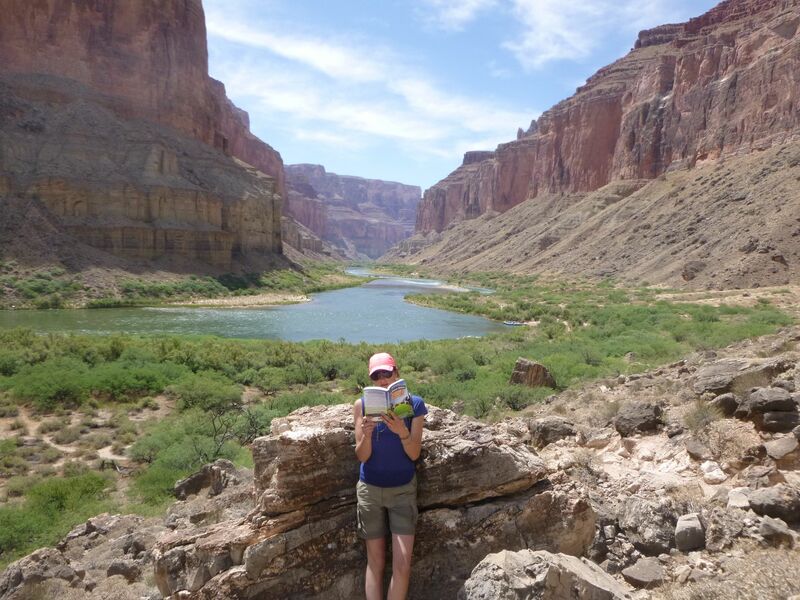 One reason I took the Canyon trip was to try to get my mind off the book, but Christy made sure I couldn’t do that. She and other people (like Jia) posed with the book in various beauty spots, to make the point that the story is so interesting that you can’t stop reading it. All right, all right. You can buy the book here. And now, back to our program. 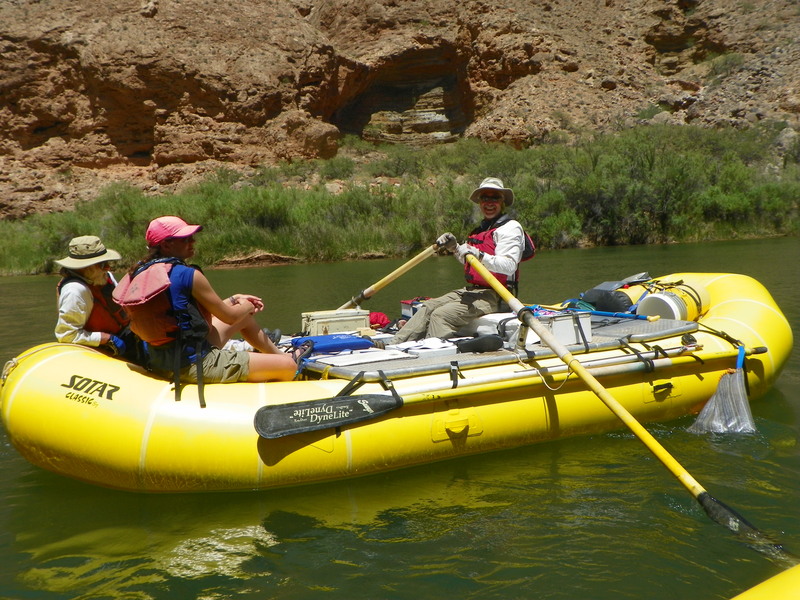 We pushed off at noon and put in another eight miles before our next stop, the confluence with the Little Colorado River. 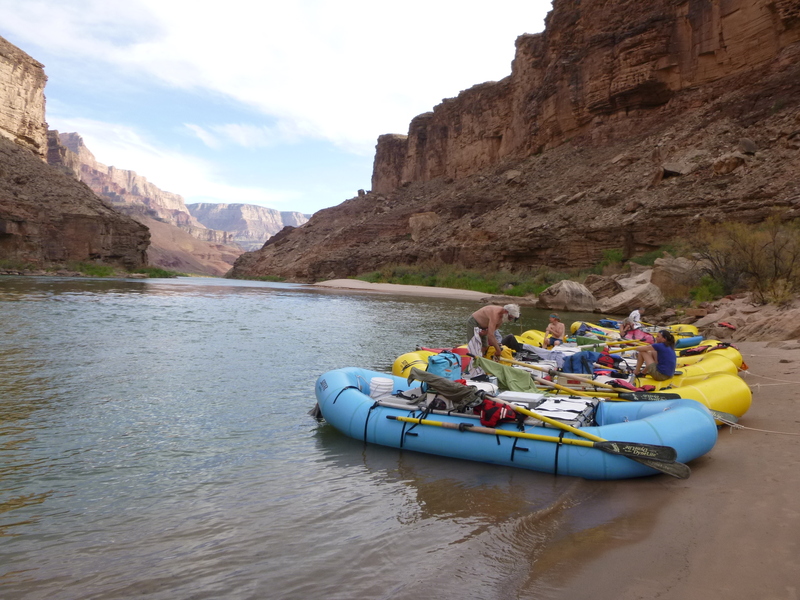 We went through fairly tame rapids at Kwagunt and Sixty Mile Canyons, and I spent most of the next two hours staring open-mouthed at the scenery. Every time I looked up, the rest of me dissolved and I turned into a giant pair of eyes. 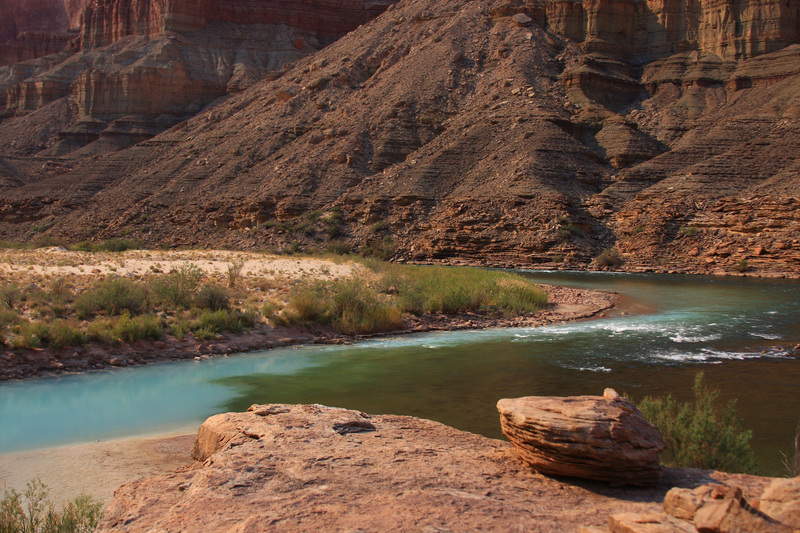 Then we got to the Little Colorado River, and everything suddenly got bluer, sillier, and even prettier. When it rains, and mud runs off the rocks and into the river, the Colorado and its side streams quickly turned brown. But we didn’t see any rain. When the weather is dry, the depths of the Colorado have a greenish tinge – but the Little Colorado (like Havasau Creek, 95 miles downriver) is a shocking swimming-pool blue. Later, I learned that this is because calcium carbonate coats the bottom of the river with a white layer, like the paint on a swimming pool. The water absorbs certain wavelengths of light that reflect off the white surface, which makes the water appear bright blue. We pulled in just above the confluence and walked upstream for a half-mile. At the mouth of the Little Colorado, the colors change as the calcium is gradually subsumed into the darker mud of the main channel; the light blue water gradually narrows into a strand and fades away. It was beautiful, like the trailing edge of a sand dune or a contrail, except it’s underwater. Another thing calcium carbonate does in water is precipitate as travertine, forming small dams and pools. The Little Colorado had lots of these. It also had a smooth bottom, and, unlike the regular Colorado, it is the perfect temperature for a long, cooling swim. But we weren’t allowed to swim in the mouth of the river, because it is habitat for an endangered species of fish called the Humpback Chub. 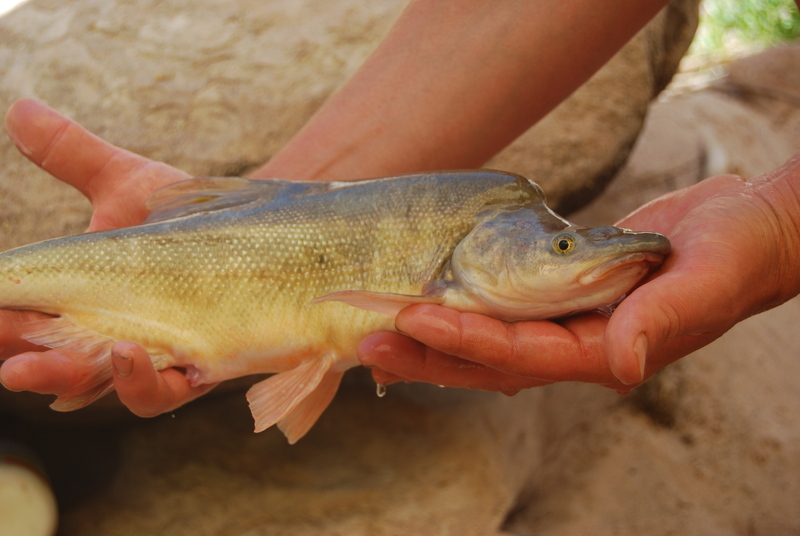 The Chub was once plentiful in the Colorado before Glen Canyon Dam was built, but the colder water and predation from non-native trout have taken a toll. The confluence is an area where the chub still spawn. 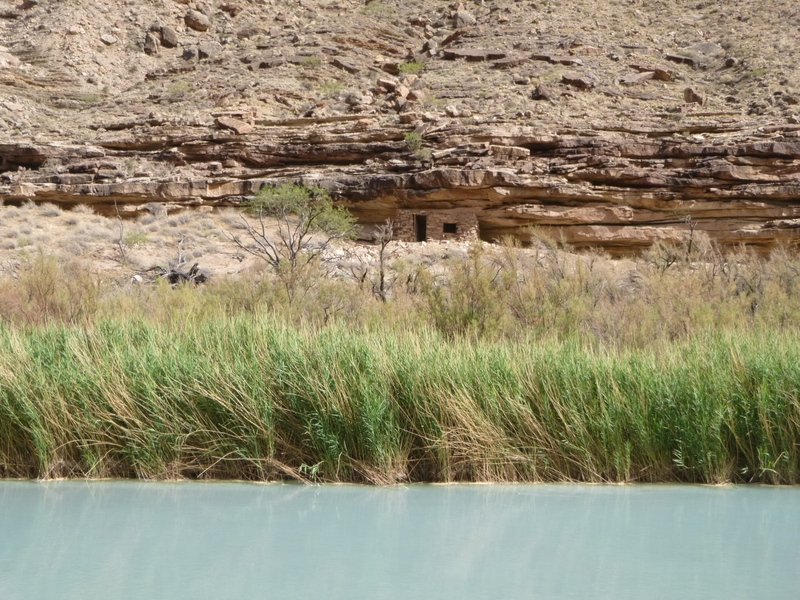 It is also the site of a cabin built into the riverbank, Anasazi-style, in the 1890s by Ben Beamer, a prospector who developed asbestos and copper mines nearby. It is also considered sacred to the Hopi tribe and is near the spot where the Hopi believe people emerged into this world. It’s a special place. That’s all very interesting. But it was hot, and we were eager to get in. 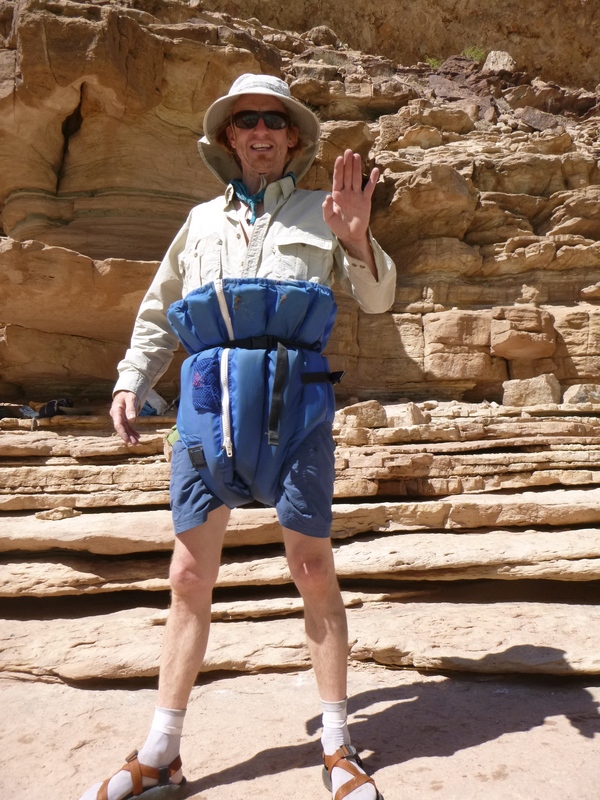 The local custom is to slide downstream, and to protect your rear end from the rocks by putting your life vest on upside down. It looks ridiculous, but at this point, it was time for dignity to go the way of modesty. “I’m glad there are no Indians watching,” I said to Lukas as we stood on the bank, wearing our huge puffy diapers. “I would die of embarrassment.” Then we had 45 minutes of riotous fun. Was it ever. 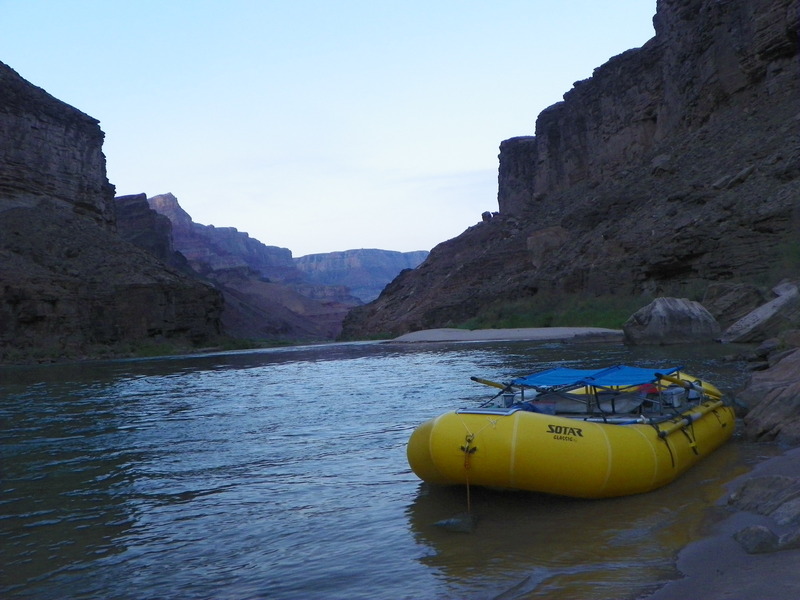 As we walked back to the boats, still giggling, Rod told me that there is a proposal to build an aerial tramway from the rim of the canyon to a point several hundred yards upstream from the confluence – in fact, at the exact spot where we had been swimming. 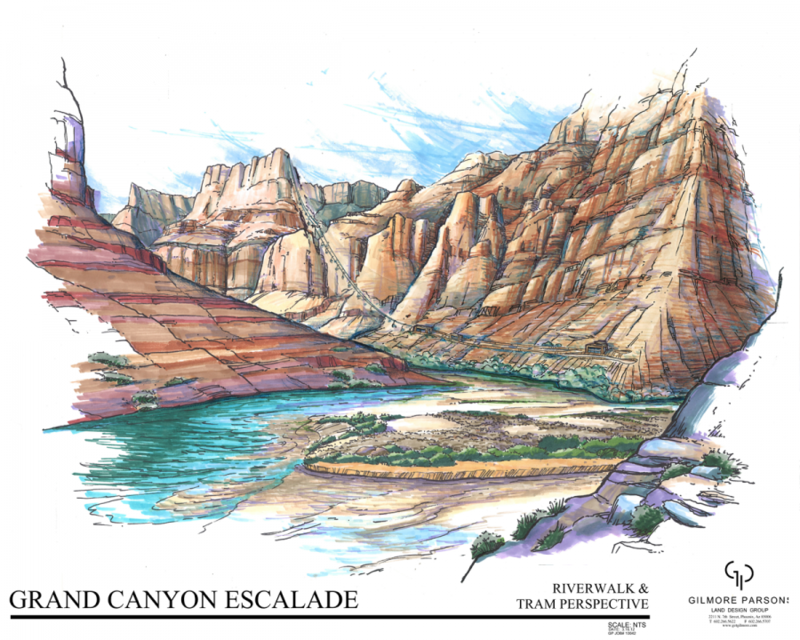 The Grand Canyon Escalade project is possible because the land near the confluence of the Little Colorado is not in the National Park. It is in the Navajo Reservation, and tribal leaders have partnered with outside investors to propose a massive tourist development that includes the tram. It seemed incredible when Rod told me this, but it really is true. The Escalade has a long way to go before it can be built. A lot of people are opposed to the plan, including the National Park Service and many members of the Navajo Tribe. Still, the story reminds me of a quote attributed to David Brower: when you’re trying to protect wilderness, every victory is temporary and every loss is permanent. A few dozen swimmers wearing giant diapers? That’s nothing. We got back in the boat and Pedro gave me the oars for the last hour. 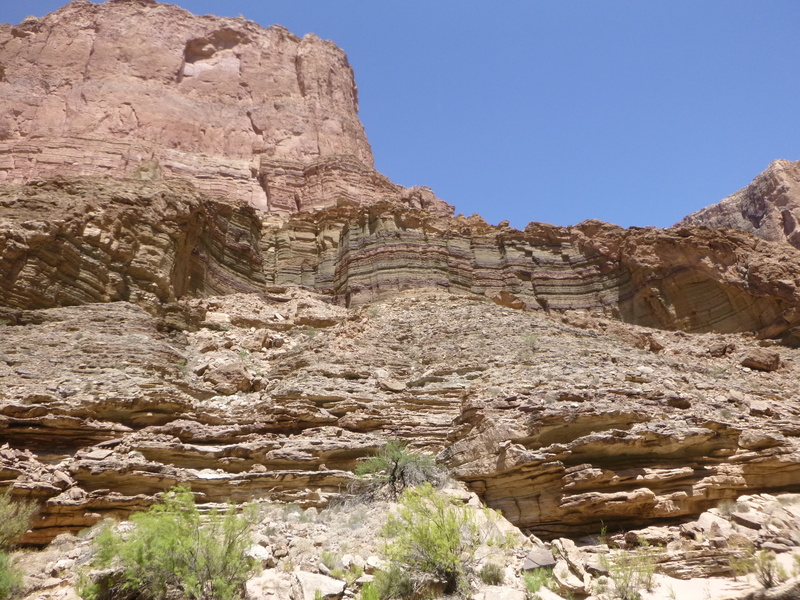 The rocks changed again; we passed another unconformity and began to see the Grand Canyon Supergroup, leading to many jokes about which rock looked the most like Eric Clapton. Then we pulled into the camp at Carbon Canyon and started the afternoon chores. People gravitated toward different jobs. For example, I helped set up the kitchen and carried water, and Chuck Kroll filtered it (see Day 1). Women took charge of dinner. Mel was the lead cook for several days, alternating with Christy. Tania worked on vegetables and was given the river nickname “chopper.” Tracey was the master of cakes and other Dutch Oven desserts, and Nan Kroll went shopping. Here’s how shopping worked. Nan would get a re-usable grocery bag and the binder that described our meals, and go down to the rafts. One sheet listed the boxes that contained each ingredient used to make dinner on a particular day; another diagram showed the location of that box on the rafts. On the first day, Nan and Chuck puzzled over the list for many minutes, struggling to figure it out. 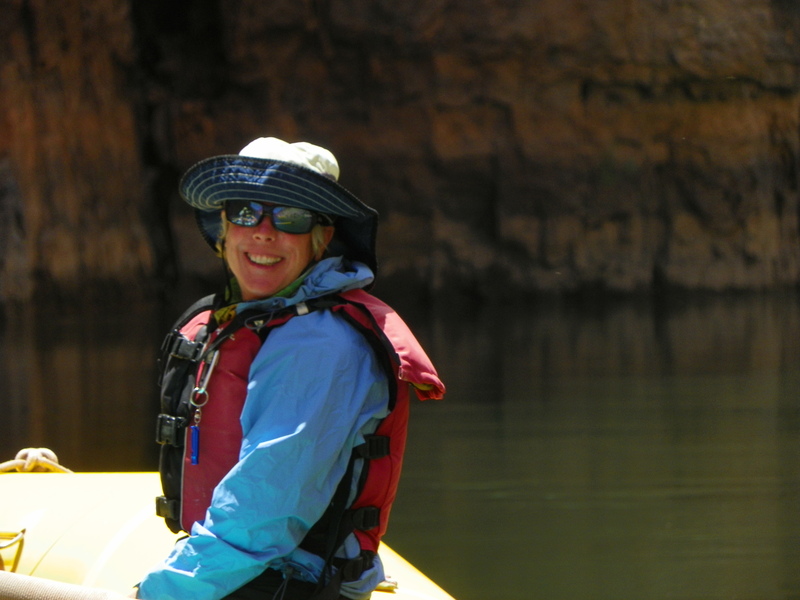 On Day 5, Nan roamed over the rafts like a worker bee, hardly looking at the book. Humans are amazingly adaptable. Like Chuck, Nan was such a positive person that she threw me off balance. I’m more ruminative, and often gravitate toward weighty or depressing topics in conversation (have you noticed yet?). But Nan’s natural tendency is to talk about happy things and laugh a lot. Jia noticed that Tania and Nan were having a good time being silly together, so she suggested a competition that Tania called a “cute-off.” Nan said something in a high, squeaky voice. Tania said something in an even higher voice. Thankfully, this was as far as it got. Tim had rafted through the Canyon as a teenager, and he remembered staying at Carbon Canyon. He told me that he thought he had scrambled up the canyon to a spot where you could see the north rim, so we decided to try. We didn’t have much time, so we moved as fast as we could. 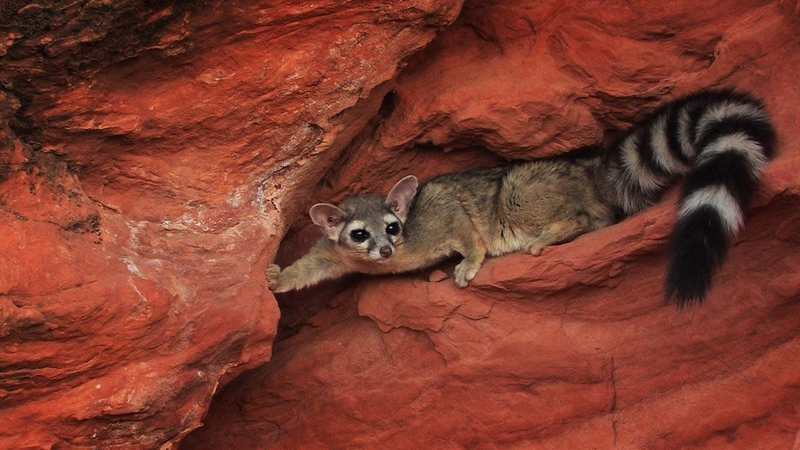 Rounding a corner, we surprised a ring-tailed cat, who quickly ran underneath a boulder. This animal isn’t a cat – it’s a desert version of a raccoon – but it is famous for making nocturnal raids on unprotected food caches. It also has a big furry tail and deep brown eyes, and Tania thinks that all three of these qualities are adorable. I was sorry she didn’t see it. Tim and I never got to the spot he remembered. Instead, we stopped after walking for about 15 minutes and sat without talking. Desert silence is like nourishment to me, and I wasn’t getting enough of it on this trip. It’s deeply meditative to be alert and able to see into the distance while listening to the sound of your own breathing. L.L. Nunn, a writer Tim and I had both read, described this kind of watchfulness as listening to the voice of the desert. Walking back to camp, I looked across the river and noticed the Desert View Watchtower in the far distance. This is a 70-foot stone tower on the South Rim, and it was perhaps 20 miles from where I stood, but I could make it out clearly. I remembered that I had also been here as a teenager – I had climbed the tower when I visited the South Rim one afternoon at age 15. I remembered feeling a painfully strong urge to go into the canyon and keep going until I saw it all. Forty years later, looking at the tower from the river, I wanted to send a message back to my younger self and tell him that he would get his wish. I wanted to tell that anxious, lonely kid that in general, things would turn out pretty well. Dinner was halibut steak, cous-cous salad, and devil’s food cake. It was ridiculously good, and so was the conversation while we ate. “One time, Tracey and I were kayaking down the Green River, and the water was really high,” said Rod. “There had been flooding, and all kinds of things were in the river. There was even a dead heifer. We kept seeing it. One night we wanted to camp on a beach but the cow was floating just offshore. We had to tow it back into the current so it would float away and we wouldn’t have to smell it. “Then Tracey lost her paddle in one of the rapids. As we continued down the river, we kept looking for that paddle. A couple of days later, we found the paddle in an eddy. It was floating next to the heifer. At least she had found a friend.” And so to bed.